Chaos unfolded at the T-Mobile Arena in Paradise, Nevada this Saturday gone as a brawl broke out between members of McGregor’s camp and Khabib’s. Fighters and fans searched for someone to blame after the dust had settled at the post-fight press conference. 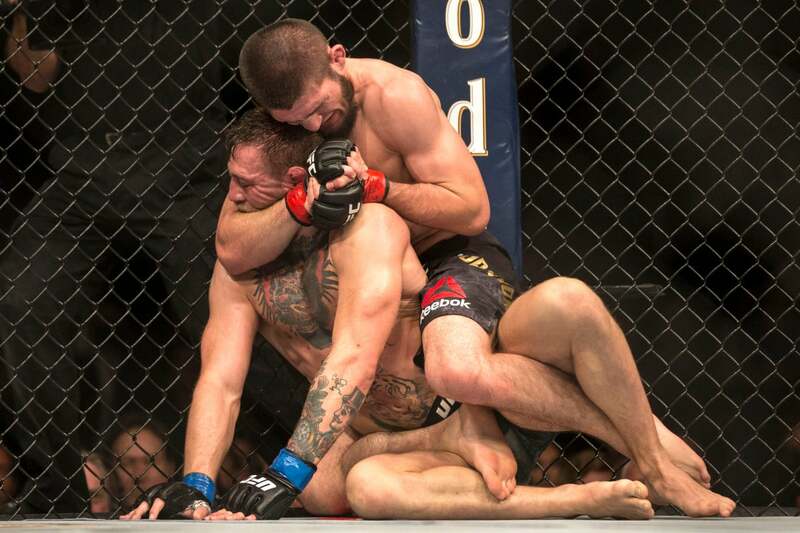 Khabib submitted Conor McGregor in the fourth round in the Main Event. A great moment in the career of the Khabib Numrmagomedov quickly turned wild with an exchange of words between Khabib and McGregor’s teammate, Dillon Danis. 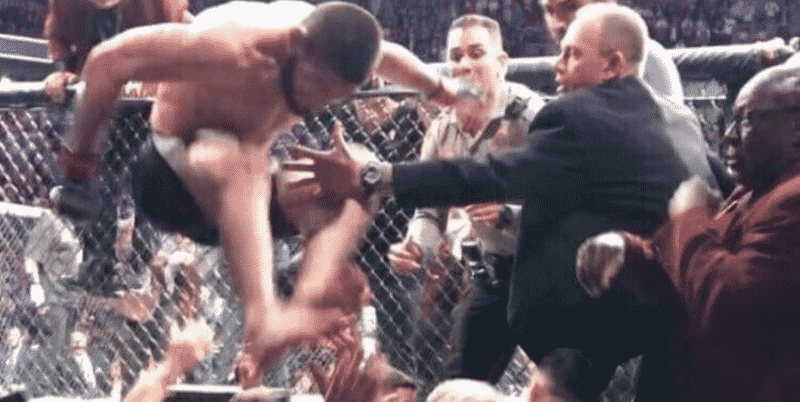 Khabib, fresh off his victory engaged in a shouting match, hurled his mouthpiece towards Danis and jumped the fence. 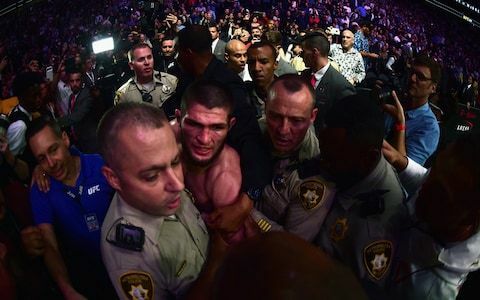 Khabib leaped upon Danis like an eagle in a moment of anger, beginning a scuffle that sent security personnel spilling into the pit to break the fight up. Pictured below is the moment when the chaos began outside the cage. 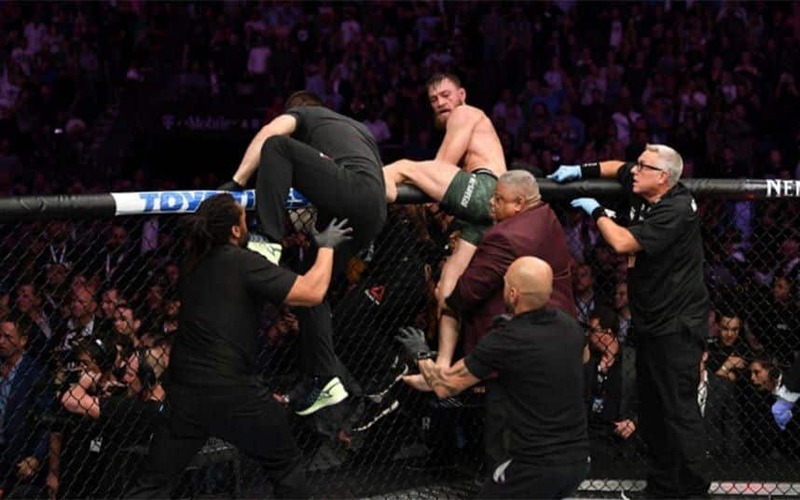 A tired Conor McGregor chased after Khabib, only security stopped him from getting over the fence. Abubakar Nurmagomedov, Khabib’s cousin, tried to scale the fence to defend Khabib in the scramble. Conor Mcgregor turned to Abu Bakr and swung for him and thus started the melee inside the cage. The grainy footage blurs some faces and makes it uneasy to identify them. On the fence, Abu Bakr threw hammer fists at McGregor and McGregor landed clean a left hand on his second try. McGregor scrambled off the cage and spotted Zubaria Tukugov moving towards him. Zubaria Tukugov, Khabib’s teammate, threw a right hand over an officials shoulder that missed McGregor. McGregor came back with a jab that stopped Tugukov in his tracks. A man in a red shirt jumped the cage and caught McGregor with a hard right hand from behind. They grapple against the cage and security pull them apart. A member of Khabib’s corner runs towards McGregor and receives a left hand for his trouble. Again, security splits them up. On fight night the camera’s pointed at the events outside the Octagon and made it look like Khabib caused all the trouble. Looking back Conor is just as much to blame for the brawl on Saturday night once spectators uploaded videos of the entire scene. Police officers escorted Khabib and McGregor out of the arena. Khabib attended the post-fight press conference and gave his thoughts on what went down. He stood firm in the belief that the blame lies with McGregor and his actions during the bus incident. Several fighters were on this bus at the time and two, Micheal Chiesa and Ray Borg, withdrew from their bouts due to injuries sustained in the bus attack. Videos of fans fighting inside the arena are doing the rounds on the internet and they are frankly embarrassing. Both men and their parties are to blame for the additional fights cage side at UFC 229. The fault also lies with some of the fans themselves, grown men who follow the behavior of the fighters they look up to. Mixed Martial Arts, labeled human cockfighting by politicians and media outlets, does not need this kind of reputation to grow on mainstream sports fans. Dana White encouraged the violent behavior of Conor McGregor during the bus incident in Brooklyn. The UFC even put it in the promotional material for this fight. A reporter asked Dana White his thoughts on the brawl at the post-fight media scrum. The question remains, how much footage of the brawl are they going to use in the build-up for the rematch?